Norwich City boss Chris Hughton has said Wes Hoolahan's run in the side has nothing to do with a change of heart over the midfielder's talents. The 30-year-old had to wait until October for his first Premier League start this season. But he has proved a positive influence since his introduction. Norwich City made 28 crosses compared to Aston Villa's nine in Saturday's draw. "My view of Wes hasn't changed. Before I came here I knew he was a good, influential player," Hughton told BBC Radio Norfolk. "Wes is a good player. He was a good player before I came here. So he's certainly not going to become a bad player overnight." 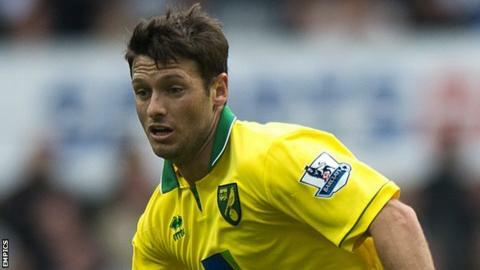 Hoolahan's reappearance in the team has coincided with Hughton's decision to play with one striker rather than two, allowing the Irishman to play behind Grant Holt. "There's no doubt he's best used in a central position because he's somebody you need to get on the ball," added Hughton. "In pre-season and perhaps at the start of the season I was looking more at playing two strikers. It's always a bit more difficult to fit him into that. "Wes is as good a player as I thought he was." The Canaries manager is also hopeful the back injury that saw Russell Martin taken off at half-time in Saturday's game at Villa Park is not too serious. But the right-back could miss Wednesday's League Cup tie against Tottenham. "I think his back just seized up a little bit," he said. "I'm hoping he'll be fine. "We've got options for the midweek game. As long as it's settled down by the end of the week we'll be OK."